Bibliotheca Rudolphi Antonii Fabricii historiae litterariae Prof. Ord. Philosophorum ordinis et totius Academiae senioris Libros ad omne literarum genus spectantes rariores et rarissimos complectens…, Helmstadii, Typis Kuhnlin Acad. Bibliop. 1776-1777. 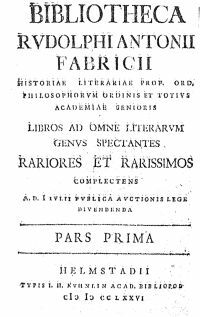 The sale catalogue drawn up at the death of Fabricius is divided into three volumes (I-II, 1776; III, 1777), for a total of about 18,000 titles, with a collection of prints. The editors decline any attempt to classify the materials given the vastness and heterogeneity of the collection. The volumes are ordered according to format; in the first two volumes there are mostly titles from the period which goes from antiquity to the 15th century.